Crich Tramway Village was established over 50 years ago and has since developed into a major visitor attraction with more than 100,000 visitors per year. The Village is an Accredited Museum housing a unique collection of trams and tram related artefacts and trams running in passenger service daily. The Museum’s success has been achieved as a result of the hard work of a large number of volunteers and staff in order to provide a welcoming experience for our visitors. 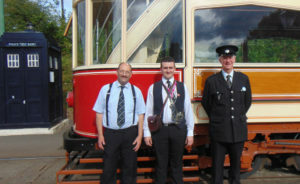 We welcome volunteers of all ages and abilities; we have a young members group who help with tram conducting, tram maintenance, special event days and a host of other things. We have families who span three generations, all getting involved in volunteering! We also have our own, low cost accommodation for volunteers to use. There is no restriction on the number of days you can contribute as a volunteer. Whether it is one day every three months, or several days a week, all volunteer contribution is valued and welcomed, every person plays a pivotal role at the Museum. Joining our volunteer team can be very rewarding; you will meet new people, put your talents to good use, develop new skills and have fun. We are keen to develop volunteer and staff expertise and full training is given to enable you to carry out your role. If you are interested in becoming part of our volunteer Tram Crew, please email: volunteering@tramway.co.uk or complete our enquiry form detailed below. We hold regular no obligation New Volunteer Introduction Sessions so that you can meet some of the volunteering team and staff, ask questions and see some of the tasks in which you could get involved. If you would like to attend one of our Introduction Sessions please complete our Volunteer Enquiry Form. If would like to find out more about becoming a volunteer, don’t be shy – email us at volunteering@tramway.co.uk or telephone us on 01773 854321, we will be pleased to hear from you.